I have fond memories of an underground dinner in Buenos Aires where the first course was an African Peanut Soup. It was creamy with a defiant touch of peanut butter. 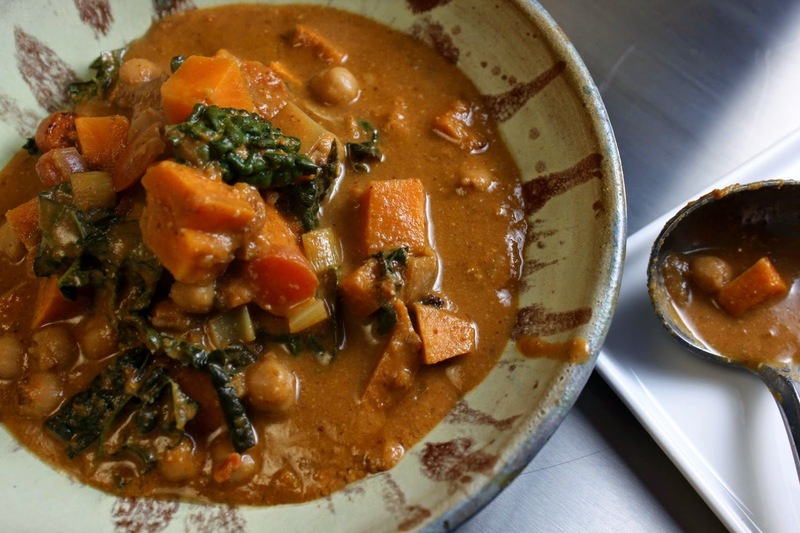 This recipe is my improvisation of what I remember that soup to be, subbing in almond butter for a healthier boost of good fat and protein and adding in sweet potatoes and kale to really add to the veggie count. Served as a stew, my version is chunky and hearty with a rich and creamy sauce, slightly less sweet without the use of store-bought peanut butter. A blend of sundried tomatoes and an ancho chili pepper give more depth and flavor than using just plain tomatoes. A touch of vinegar at the end adds just a hint of brightness. Sub a squeeze of lemon or just skip this step if it makes you nervous. 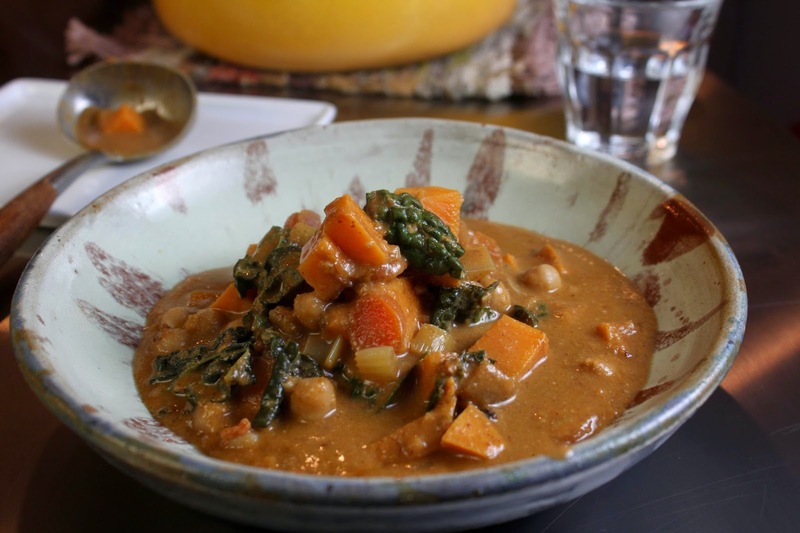 It’s the perfect stew/soup for those still riding out freezing temperatures. Just cup your mug, close your eyes and let the flavors take you to a warm sunny spot south of the equator. Place the sundried tomatoes and the ancho chili pepper in a bowl and cover with warm water; set aside. Heat the coconut oil over medium heat and add the onions and carrots. Stir to coat and cook until just softening, about 5 minutes (stirring often). Add in the sweet potato, garlic, ginger, clove, cumin and cayenne pepper. Cook another 3-5 minutes, stirring often. Deglaze the pan with the broth, cover, reduce the heat and simmer until the sweet potatoes are almost fork tender, about 10 minutes. If the potatoes get overcooked the stew will be a bit mushier. Place the sundried tomatoes, the chili pepper (stem removed but seeds can remain), salt and the almonds in the blender. Add 1/4 cup of the soaking liquid and 1/2 cup of the warm broth from the soup pot. Carefully blend to create a very thick but relatively creamy sauce, adding additional warm broth as needed. Pour this into the stew along with the chickpeas, continuing to cook until the potatoes are cooked. Serve on its own with a hearty bread or over a quinoa or brown rice. Enjoy! Happy Healthy Tips: What’s wrong with peanut butter? Besides the obvious of added sugar, hydrogenated oils and chemicals when store purchased, peanuts are one of the most heavily pesticide-ridden crops and are prone to mold. Not worth it when you can make almond butter in a flash!